28 - Bubble Run Jog-a-thon! 29 - Last Day of School - Spring Break! 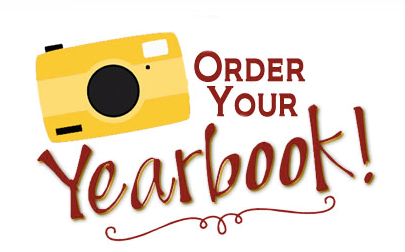 19 - Yearbook Orders DUE! 29-5/3 - Teacher Appreciation Week! Your Turtle Rock Elementary PTA is looking to add a few new Board Members to the leadership team for the 2019-2020 school year! 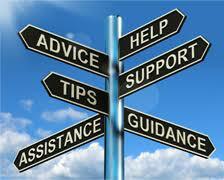 We still have a few open board positions left including, Fundraising and Membership. Now is the time to sign up. Make an impact in our school and meet other amazing families along the way! Please join our fun and amazing team of PTA parent volunteers! 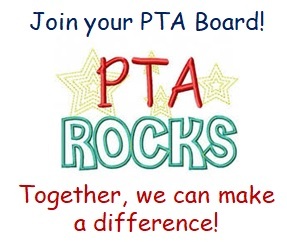 For more information on open positions and how you can be involved, email president@pta.rocks. The beginning of March kicks off our FUNdraising drive for one of our largest events of the year. Envelopes will be going home in conduits this week. We have lots of great new individual fundraising prizes and even a new Bingo game where students can win an American Girl Doll, BB8 Star Wars toy, Legos, and more! New Principal's Challenge: Layer on the ice cream and caramel sauces as Mr. Stonebarger becomes a HUMAN SUNDAE when we reach our challenge goal of $75K! Class prizes: Run through the bubbles first! 1-6th grade classes with the most participation (highest % of envelopes turned in) will earn primo placement on the track and be the first to run through the bubbles! 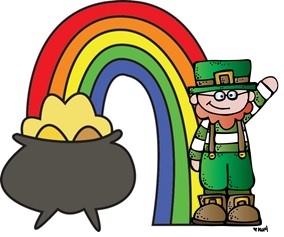 Grade prizes: 1 primary and 1 upper grade winner with the highest amount of fundraising can earn a donut party, lunch on the lawn, or 10 min extra recess! Read all the great prize details HERE and make your donation today! 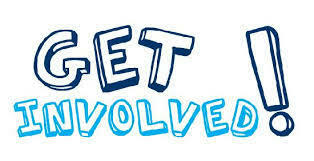 Volunteer SIGN UP: Parent volunteers are needed for Classroom lap counters and event day helpers. Please sign up CLICK HERE. Prize Donations: The PTA continues to seek sponsors and/or prize donations from local retailers. If you have a favorite local restaurant, please print out the sponsor letter and ask them to donate goody bag coupons or prizes. Contact FundraisingVP@pta.rocks for more info. Make sure to pre-order your yearbook, now through April 19th for $20! 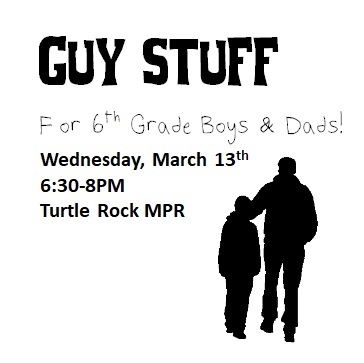 Join us at Turtle Rock for a night just for 6th grade boys and their dads/male adult mentors! We are pleased to welcome Craig Cooper, a subject matter expert who has led this session at a number of IUSD schools, to speak to our young men about their health and what to expect as they transition to adulthood. A pizza dinner will be served, goody bags handed out, and boys and dads get to have an informative and fun Guys night out!! Box Tops for Education! Congratulations to Mrs Palmer's class for collecting 515 Box Tops and winning the first Box Tops competition. They will be getting a popcorn party and extra recess. Also congrats to Ms Lezak's class for collecting over 300 Box Tops and getting extra recess. Please continue to collect Box Tops and bring them to school so your class can win a popcorn party or extra recess! !